Our web- site is set up to honour and remember our son Gary who passed on the 22nd May 1999. Gary had many unique qualities, most of all the love he shared with us. Through our pages we hope to tell of the magic we felt made Gary so very special. Gary was born on a very cold 5th Feb 1985. I remember keeping the log fire going through out those long winter nights as we eagerly and lovingly cared for our first born. It was the start of our journey of fourteen years with Gary. Gary on the left ( his arm was always around his brother or sister). 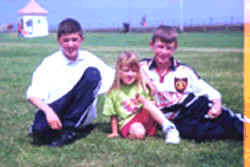 Summer in Bray Dublin 1998 Gary thirteen years, Stephen aged eleven, and Lisa aged five. Our three very precious children. To introduce our family Christine (Super mom), Brendan (Dad the drip who complained), Stephen (The Rock Guitarist ) and finally Lisa (The" Cleverest Girl in the World ". Our memory of Gary include, his cleverness, his entertaining ways, and the love he shared. Its hard for me to describe a lifetime in a few words but at two he could spell many big words to mention a few, Quinnsworth (our local supermarket), Shell oil, names of road traffic signs, registrations of all the cars in our street, the make of all cars and much more. By the age of three he could read all children's books and had memorized at least twenty. When it came to talent shows he loved to recite one of these stories. By five of age he could tell you the names of all the Presidents of America, when and where they were born, how long they served, if they were married and lots of facts about them. In fact in our minds and a lot of other peoples minds he was a genius and he was our son. If I succeed in nothing else in life I lay claim to knowing Gary Somers. From a young age he was seen by many of his peers as different and this led to him being bullied. With that came a cruel side to life. He felt this in the community, in school and on the football playing field. Gary encountered so much bullying at football it left him feeling isolated and this eventually forced him to give up. Gary was of a sensitive nature a rare trait to have in these days of " tough teenagers ". He was " his own man "and was never swayed by the pressure from his peers. If he knew something to be wrong he stood firm and the bully tactics always failed, he maintained his self esteem. His school principle told Gary in front of his class " he was the bravest boy he had seen". For this and reasons known to us Gary earned the title " The Honourable Gary Somers , Champion of the Underdogs " (the inscription on Gary's headstone). Gary's honor meant so much to him and he spoke about this in the period before he died. He has left us with a lasting memory reminding us of the value each person should be given and the tolerance we should afford those around us (easier said than done).